India 2018: Celebrating 40 Years! What do you think of when someone says India? Before I came to this sub-continent, I would have said crowded cities, air pollution and grid-locked traffic. I am writing this blog from India, and it turns out that none of these descriptions are true in this case. I am on the coast; the sky is blue, and there is far less traffic than there is in Toronto. While things I’m used to having in Canada are mostly available here, I'm missing hot water for a shower and a good cup of coffee! I’m in India for two specific reasons. First, I am here to be part of TWR India’s 40th anniversary celebration. All those years ago, they started in five languages; while we are here, they are launching their 100th language. That sounds like a lot and it is, but for this country there is still a long way to go. Their goal is to be in 150 languages by 2020. The celebration was the largest I have ever seen in all my years with TWR, with over 2,000 people in attendance. I met one man who had travelled four days by train from the Punjab region to be a part of the celebration. To see these 2,000 people all together was a sight to see all by itself. The final service was on the beach, and most of the people simply sat on the sand for the service, which lasted almost three hours. In addition to the celebration, I’m also here to see how TWR Canada’s investment in the ministry is impacting the nation. In recent years, we have taken an active role in the ministry here. Our first major project was helping resource a digital studio capable of producing both audio and video programming. With that completed, we produced Discipleship Essentials in the Hindi and Bengali languages. During my time here, I met a man who has trained over 200 leaders in how to implement DE in their local areas! His co-worker told me that he will be using DE in all his churches, which number in the hundreds. It’s an impressive movement. TWR India broadcasts in major languages into India from three locations. This radio ministry has received incredible response rates over the years. Over the last 40 years, there have been times when they received over 50,000 responses in a single month! More recently, TWR India has been able to establish over 5,000 radio home groups in the country. What is a radio home group? New technology allows TWR India to produce programs in local languages and put these recordings on an SD card, which then goes into a media player. Seven to ten people then come together in local communities once a week to listen to the programs, discuss them and learn together. The impact from this has been amazing with over a thousand new groups being established each year! The testimonies we heard from these groups brought tears to my eyes. Bringing the gospel to someone in their heart language allows them to truly understand the truth of the gospel. It helps them understand God in a personal way, understanding that he is not a foreign God, but a God who is interested in their personal circumstances. TWR Canada is assisting with the players that make this ministry possible. Along with our partner, Thru the Bible, this media player ministry has become a great blessing. In just a few months, Discipleship Essentials will be added to the SD cards so these groups will get solid Biblical teaching along with practical tools for day-to-day living. It is so exciting to be part of this! A nation is being changed as a result of the gospel, and we get to be part of it. While here, I was told that in India 70% of the wealth of the nation is in the hands of 1% of the population. This means that for the most part, the country is poor. When people receive Christ as their Saviour, they become rich in the Lord. You can see it on their faces and in the way they conduct themselves. I never get tired of seeing how God brings hope to the hopeless, or seeing the joy on someone’s face as they share how God has changed their life completely, even though the circumstances of their daily life have not changed. India is an exciting place to be as you see how God is changing this nation one person at a time! TWR India is unique in another way. In spite of the poverty in the country, the local people cover 50% of the cost of running the ministry. This is exceptional for a country where financial resources are scarce. It is a clear indication of how important reaching the nation with the gospel is to them. I mentioned above that TWR Canada assists financially with the media players. For every dollar we raise for the players, they raise the same amount in India. This is a wonderful model as it clearly demonstrates partnership in ministry. 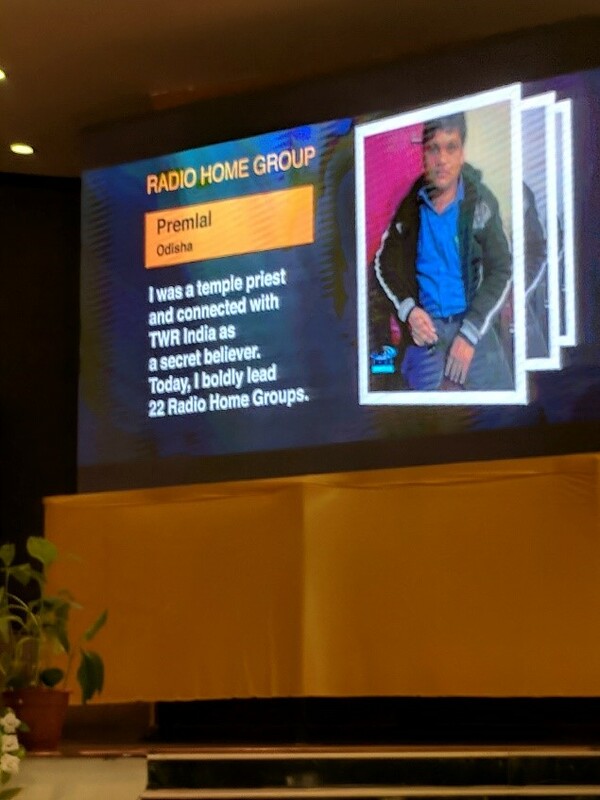 Being in India for the celebration was wonderful; seeing the radio church leaders and their excitement to evangelize the nation served as an encouragement to strengthen the partnership and to be part of helping them achieve their goal of broadcasting in 150 languages and having radio home groups in those languages. I can see the day when there will be not 5,000 radio home groups but many times that number! I saw Matthew 28:19 being fulfilled right before my eyes. People from every tongue and nation were rejoicing before the Lord. The exciting part of all of this is that Indian Christians are evangelizing their own nation, and we get to be part of that by supplying the technology to make it happen.